When we write poetry, we are on the highest level of consciousness and joy. Our brain becomes the quantum field where anything and everything is possible, where we step into the two rivers at the same time, where magic is a norm. Her publications include Ten Thousand Waves, poetry book from Wings Press, 2014, American Visa (short stories, 1994), Foreign Devil (novel, 1996), Of Flesh and Spirit (poetry, 1998), The Magic Whip (poetry, 2003), The Last Communist Virgin (stories, 2007), all from Coffee House, New Generation: Poetry from China Today, 1999 from Hanging Loose Press, Flash Cards: Poems by Yu Jian, co-translation with Ron Padgett, 2010 from Zephyr Press. Aching for Beauty: Footbinding in China (2000, University of Minnesota Press, 2002 paperback by Random House) won the Eugene Kayden Award for the Best Book in Humanities. The Last Communist Virgin won 2008 Minnesota Book Award and Asian American Studies Award. She had many multi-media exhibitions: “Behind the Gate: After the Flooding of the Three Gorges” at Janet Fine Art Gallery, and “All Roads to Lhasa” at Banfill-Lock Cultural Center, and “Kinship of Rivers” at the Soap Factory in St. Paul and Minneapolis, Great River Museum in Illinois, Fireworks Press at St. Louis, Great River Road Center at Prescott, Wisconsin, Emily Carr University in Vancouver, University of California Santa Barbara, and many other places. 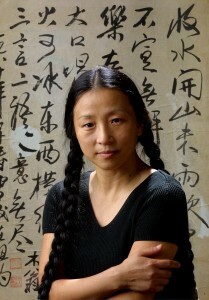 She collaborated with the British filmmaker Isaac Julien on Ten Thousand Waves, a film installation about the illegal Chinese immigration in London. She is the recipient of National Endowment for the Arts, New York Foundation for the Arts, New York State Council of the Arts, Minnesota State Arts Board, the Bush Artist Fellowship, Lannan Foundation Fellowship, Vermont Studio Center Fellowship, and the McKnight Artist Fellowship.